“We often hear about stop deportation activists campaigning against deportations. However, we rarely hear that some people inside detention centres put themselves at risk to stop their fellow detainees from being deported. I imagine that this is because if these ‘activists inside detention centres’ are found out, they face further repression – being isolated within the prison and losing any real chance to remain in the UK. Meet ‘X’, from Pakistan. He has been detained for some time in one of the UK’s Immigration Removal Centres. His story might be similar to many people who are detained, but he has made a special effort to support other detainees win their legal battle to stay in the UK. X from Pakistan is an anti-deportation campaigner inside the detention centre where he is detained. So far, he has helped 35 people get released from detention. He has learned about the different laws, such as Article 8 in the European Convention of Human Rights, which can prevent people from being deported. 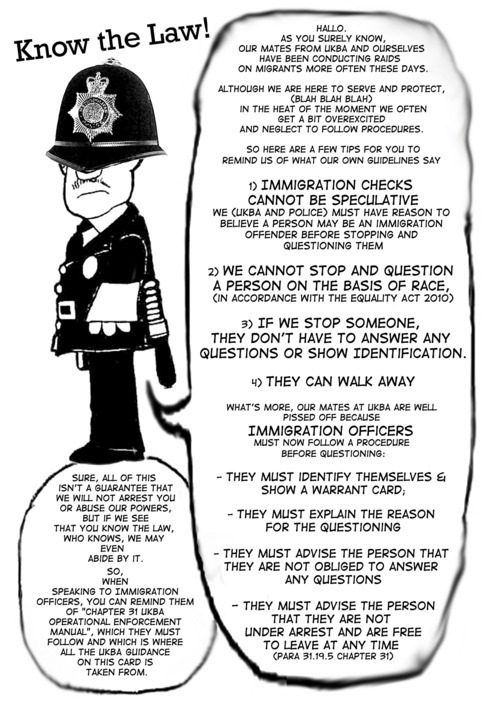 He has explained that when people have removal directions (deportation flight tickets), they often ask him to do their application for a Judicial Review, and/or for applying for asylum or to stop the deportation by filling the section 39 for the European Human Rights Court. He says that the UKBA is breaching human rights. He compares his knowledge of asylum law with the reality of what is happening inside the detention centres. He can see that people are detained although they have been tortured. That people are deported even when they have legal reasons to stay in Britain. He keeps saying how sad it is to see people being deported back to countries where their chance of being able to survival are hardly none. X for Pakistan had a good life in the UK. He loved going out clubbing, drinking and having fun. He also had a job and was paying taxes like many of us. One day, he was put in a situation where he got angry and lost his temper. He became violent towards two people and due to this, he was sent to prison for more than a year. In prison, he started studying to learn how to administrate paperwork. After been in different immigration removal centres, he has learned how the immigration system works. He combines this with other administration skills to stop people for being deported and to provide them with what all human beings deserve, a safe life. These activists inside detention centres are not known. Sometimes, we hear how a detainee did someone else’s Judicial Review but we never normally meet the detainee who made these applications. I was lucky to meet one of them and to be able to know more about what he is doing and about his story. He is doing what he can to prevent others detainees being deported back”. Tory Party Immigration Minister, Damian Green, announced in Parliament on 7th February 2012 that “We continue to exploit opportunities to increase returns. This includes opening and consolidating new charter routes to Ghana, Pakistan and Sri Lanka”. 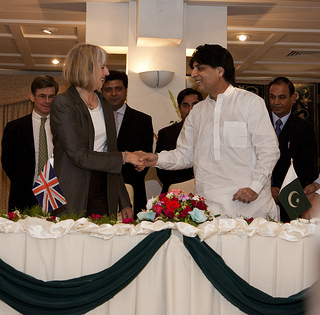 There was a mass deportation charter flight to Pakistan from UK on 6th February 2012, its unclear if this was the first. Another took place on 19th March 2012 [PVT120] – at least one of the airport-transfer buses for this flight was branded “Just Go! Holidays by Coach” and the plane allegedly departed from London Stansted Airport. Then another took place on 11th April 2012, and another on 1st May 2012 – Anessa Bibi was booked onboard. The political context behind these deportations might lie in the power shift from the Labour Party to the Conservatives . A wiki-leaked cable from 9th December 2009, (less than 6 months before the Conservative Party won the UK General Election from the incumbent Labour Party) details how the Shadow Defense Minister, Liam Fox, met the US Ambassador to Britain. The pair discussed Labour’s preference for Pakistan in foreign policy, and suggested this would change under the Tories because “the Conservatives are ‘less dependent’ than the Labour Party on votes from the British-Pakistani community“. Britain’s Pakistani community is more than a million strong and should have the capacity to resist this attack if it decides to organise against deportation. 7. (C/NF) Turning to India, Fox criticized the Labour government for policies which reinforce the Indian government’s long-held view that HMG’s foreign relations on the subcontinent are “skewed to Pakistan.” Fox predicted this would not be a factor under a Conservative government, since the Conservatives are “less dependent” than the Labour Party on votes from the British-Pakistani community. hello sir i was a student in uk and i came myself for a claim a asylum in craydon despite they detained me and put in a fast track policy which is very unfair and against the human rights durning the stay at center i have exprinced so many aspects of life which have change my life. according to my observation mostly guys in centers have mentel and sycological diseases because of detain there. i have been lived there three months and they ruined my life i have lost all my hope and passion. mostly staf in the centre exploites the other guys and misbehave them.they provide such a food which is unhygeniec and injurious to human health.mostly guys had stomach and other problems which is very aweful and against the human rights.actually they can’t handle all these activities,they have got these contract only for mony making just ,they got upto 5,000 pounds for each person from diffirents ngeo’s and other extended institutions related to united nations.in short this policy is no good and totally against the law of human rights,this proceddure is only for mony making and do nothing, During the stay here i used to help other people in filling forms and in witting diffirent kind of applications and letters.i have come to know too much about these centres and there proceddures how the detained and what for they give assylums but in fast track policy they deport 90% people to ytheir home country,they have a policy to refuse every person,now a days they refuse approximately everyone ,some time they realese some persons without any prosicutions and investigation which is very unfair,i’m totally disagree with policy because they treats human being likes donkeys and horses which is very painful.please do something to close these detentions.